Where on Earth? : Geography as you’ve never seen it before! 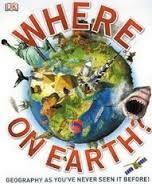 DK’s Where on Earth: Geography as you’ve never seen it before! will stir a child’s excitement for maps. It is packed with facts, statistics, graphics and a collection of 80 specially commissioned world maps that will show readers not only where things are, but will help them understand why tectonic plates cause volcanoes and earthquakes, what is the most common cause of shipwrecks, and what can cause a hurricane to form. The information is divided into six chapters: Land, sea, and air; Living world; People and planet; Engineering and technology; History; Culture. The design is similar to other DK books; heavy on photo and light on text. Each chapter begins with an introduction. Let’s look at Culture. The word “culture” is a broad idea and includes the values, beliefs, and behavior of a society, or group of people. Culture includes many things, including customs, language, religion, music, art, food, and clothing. Some points of culture are traditional, having survived virtually unchanged for centuries. Others are short-lived, such as fashion styles and trends in pop music. Photos around the page offers brief examples to support the above statement. Now turn the page to see a world map of languages and where they are spoken. Other maps within Culture show holy places, tourism, art, statues, festivals, television, stadiums, car racing, roller coasters, and national flags. This is a good book for browsing and can be used as an introduction to the variety of topics it covers. Each chapter can be connected with other nonfiction and fiction titles. Partner the chapter on 'People and planet' with Peter Menzel's book, Material World: a Global Family Portrait. Your description of how you became interested in maps reminds me of "How I Learned Geography" by Uri Shulevitz. In case you haven't read it, it's a beautiful book! This DK book sounds beautiful as well! Looks great. I need a book like this because I am so bad at maps and I want my kids to learn to read them better than I. Maps can tell lots of stories. This looks like a great resource! I bet the pictures are fabulous! :) Thanks for sharing.